Caught under a mountain of fuel transaction paperwork? 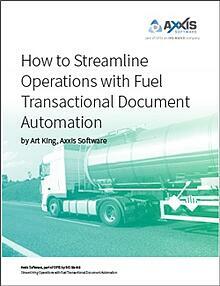 Download this educational e-Book and learn how automation can help you simplify the tedious and often time-consuming process of collecting, translating and archiving fuel transaction documents. Using technology to get a complete view of fuel movement from dispatch to delivery allows your business to cut costs, save time and shorten the reconciliation and billing cycles. Automating the capture of transactional documents, such as supplier BOLs, invoices, credit card memos, EFTs and more. Auto-matching documents so you can focus only on exceptions. Interfacing directly to the accounting system. Ready to see how it all works? Sign up for your customized free demo of Axxis Software automation tools.